And the thread is now complete. Got them dismounted and picked up today. now I can consider all the possibilities. The little plastic bolts will get replace with real stainless steel bolts. will have to draw up a couple of plates to replace the XD emblem that's got to go. Ill get the tire put in the bed tonight and leave the wheels outside suppose to rain tomorrow free warsh service since the boss hasn't put the pressure washer out yet. Blue (like the 150) same as what you have now, with white, then bottom of door panel, from crease down darker silver. Trailer Blue roof cap then white and silver bottom 4” of trailer. Powder coat XDs Blue or Silver (not really an XD fan) or replace with shiny aluminum 19” ones. 2012 VW Touareg TDi Rawtek exhaust Malone tuned. Not a fan of Silver at all. A little chrome is nice but not a big fan of that either. The Bottom of the doors Will be the same blue as the top. and on the trailer there is a parting line down the whole trailer level With the bottom of the Hang over. So will have a short section of white or Blue at the roof line then a strip down the center and then a large section below the parting line So I can either mirror the truck blue white blue or go white blue white. Part of the reason I painted the truck was to much white. So I want to do just like the truck but the rv guy in me who has always been white roofs reduce heat. So I plan On using high R value spray foam on the inside so color of roof may not matter. I also plan on having a break of sheet foam in between the paneling and the frame inside. Have i mentioned I have wanted a Blue vehicle ever since I got my first car and everytime buying something has come up I have compromised because I got a much better deal on a different color that was in stock. The one time I almost bout a blue car I had agreed on the price the dealer wanted but the bank thought it was 500 dollars to high and refused to budge so i took my money from ford to cheby and drove a none blue car home that same day. As far as the wheel size goes the only way I would go larger would be to run 19.5 truck tires. Other then that I don't like big wheels. Plus I would have to find steel dually wheels to match the size of anything I bought. When I got my Xd's they actually sent me 18s but I already had new 16 inch tires and no source for 18 in steel dually wheels. 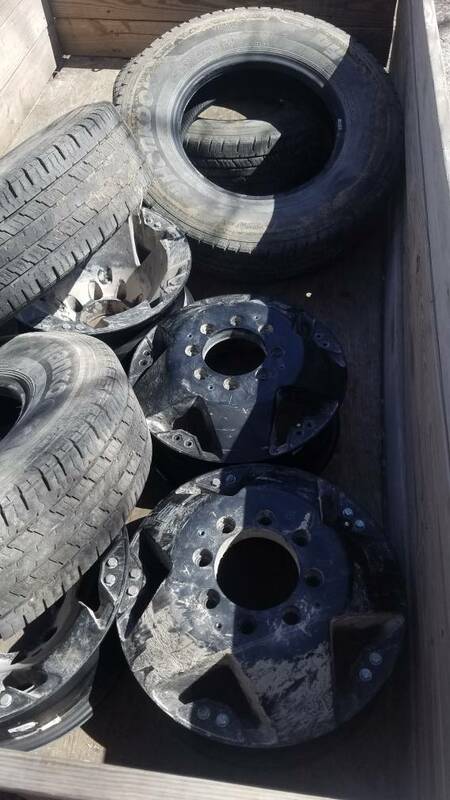 So my truck will stay 16s unless I came across a set of 19.5 inch wheels and tires that bolted on with no adapter. In order to be able to post messages on the PowerStrokeNation : Ford Powerstroke Diesel Forum forums, you must first register.